Marketing is getting pushed out of the boardroom and strategies built around customers are going with it. It’s a self-inflicted banishment, and marketers – including many CMO’s – are worried about it. For Graphic Communication firms, this presents a two-fold challenge and opportunity, which we’ll describe in a moment. How did this self-imposed exile happen? Gradually and through the creation of marketing automation. Marketing Automation is a useful and effective tool, but only when embedded into a strategic process. It is no panacea, and cannot substitute for a strategic process. It can respond to specific impulses / signals, but that again means it needs strategic thinking to drive it. When the CMO is pushed from the boardroom and out of all things strategic, the enterprises become self-centered, inwardly-focused on meeting current demand for today's products. Unwittingly they make themselves more vulnerable to future competitive activity. Marketing began as the creation of channels to reach a market (hence the word “marketing”). It developed into the business function responsible for understanding consumer or customer needs and wants and finding ways to satisfy them. Today, the tracking capabilities of online digital media have given rise to quantitative analytics. This leads to the idea that marketing can be like any other process: it can be modeled or simulated using formulas and decision trees. That is, if you can identify certain patterns of trackable actions, you can intercept a prospective consumer or customer in a way that will increase the likelihood of a sale, and you can probably automate it. The bottom line of this new (and erroneous) understanding: marketing is not a process of nebulous sociology and psychology. Instead, it is sequential actions that can be measured and quantified. Getting people into the “sales funnel” and tracking how they act makes them self-selecting. The “suspects” qualify themselves, rather than marketers and sales managers evaluating and selecting them. This means marketing becomes a tactical function not a guiding strategy. Tactics are predictable and repeatable processes. For those who support the sales funnel the best case would be that marketing is a process that’s run by a black box in a room without lights. Clicks are attracted using almost any means necessary. Raw leads appear on the radar, nearly always online. Leads go into the grinder of “qualification” powered only by their own activity. Marketing automation measures and tracks their virtual progress. “Unqualified” (insufficiently interested or motivated) leads drop out. Sales are produced at the other end automatically, with minimal human interaction, just like a manufacturing process. 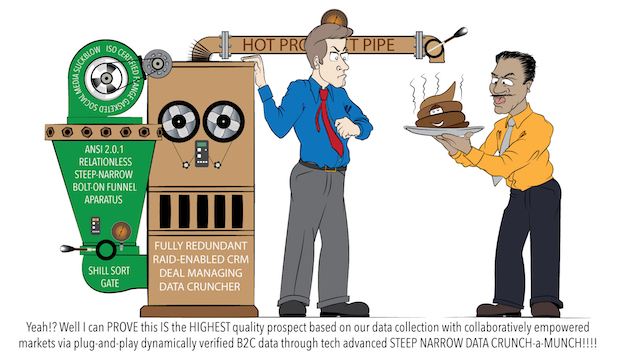 In many B2B industries, 80% of your prospect companies can be known with great certainty. A simple example is if you sell to automakers. You know who they are. It's a matter of finding the right people. And with the right detective work, they can be found. Any unknown prospects can be identified through research of some kind, and the rest can be found with feet on the street, whether the customer's feet, a dealer's feet, or your very own. In that case, you could know 100% of the prospect companies. Other B2B products can be purchased “off the shelf.” It is those situations where automation can be used with great effectiveness. Companies like Amazon and Staples have shown that. Is there a sales funnel for these companies? Not really. Their sales funnels skip the creation of attention, interest, and desire. Transactions and revenue are primarily the result of having products in stock at the right price and in the right place for customers who have already made a decision to buy, and who are finishing the selection process from among multiple options and offers before completing the transaction. Activity-based (rather than results-based or outcomes-based) metrics enable marketing staff to fold their arms and claim a win, whether new customers and new revenue are being created or not. That misses the point completely. Marketing strategy isn’t about activity. It’s about where you’re winning, where you’re losing, and where you have an opportunity to compete more effectively. Those criteria inform where to invest limited resources (time, talent, budget) and where to stop investing them. That’s the beginning of every effective marketing strategy. Second, we’re seeing the gulf between marketing and selling grow wider as salespeople see and hear the claims of marketing folk, and rightly judge them as irrelevant. The evidence is the growing frequency with which we’re hearing that the biggest problem is meeting the need for viable prospects. Uh oh. At the leadership level, executives have begun to view marketing as a machine: feed it big data, and then let the software manage it and figure it out. The challenge is that it appears to work, until it doesn’t. The newly defendable position of B2B marketing (“We’ve got the metrics to prove it!”) tends to focus the attention and the blame for insufficient revenue growth on the sales function or organization. But the defense isn’t really working well. And the climbing turnover rate among Chief Marketing Officers is the evidence. Spencer Stuart, the executive search firm, publishes an annual study of CMO’s. In their most recent report, median tenure for CMO’s dropped to 26.5 months, from 35.5 months when measured a year earlier. A full third of the CMO’s surveyed were new in their roles, the highest Spencer Stuart has seen since they started tracking in 2004. And that’s happening simultaneously with the widespread implementation of big data, marketing automation, and content marketing / native advertising. Oops. What does the change of a CMO mean to a company? They stop implementing their marketing strategy, they take time to think about and settle on a new one, and then implement it. Typically, this takes 18 months. In those 18 months, the marketplace changes and many competitors keep acting in their own interests. Mechanistic approaches to marketing are based on rules. Is the CMO's job to change the settings in the machine, or is the job to change the guiding principles that direct the company's presence in the marketplace? Many CMO’s are now uncertain which is their primary task. And in the face of uncertainty and criticism, it’s easy to default to the mechanical, measurable, and explainable. As the gulf between marketing and sales widens, so does the gulf between the boardroom and sales. If marketing is mechanistic, so are the activities of B2B sales drones who must present information to prospects and clients in the exact way specified. The benefit of a personal sales force is adapting the information flow to the unique characteristics of customers and prospects. Most customers are alike in many ways, but the differences in applications, structure, and target markets need the detection and insight of a human sales force. The personal sales force is the original customer-facing strategy. Personal selling deals with qualitative issues, subtle and obvious, rational and irrational, and deciphered motives for purchase. The funnel implies predictable and repeatable patterns of activity. Unfortunately markets and customers are rarely either. Marketing is ceding its primary role in the creation of a customer-facing strategy in order to answer a decades-old criticism about results that have been tough to measure. And that criticism isn’t a new thing. John Wanamaker, the department store founder who died in 1922 made the still-repeated statement: “Half the money I spend on advertising is wasted; the trouble is, I don’t know which half.” The siren song of “measurable results” coupled with the availability of Big Data and Marketing Automation has seduced marketers to take their eyes off the strategic. And the attendant consequences are huge. At the executive level, one of those is the loss of credibility when marketing is viewed as a mechanized and lights-out process. Marketing looks linear on the outside but is dynamic and often random on the inside. Not all transactions for information can be known or detected. Not all engagements have the same value. Not all customers and targets have the same knowledge and business impulses. Marketing may have a general direction and objective, but prospect engagement has fits and starts, interruptions, retrenchments and leaps forward, changes in contexts and timelines, fickle values and preferences, rational and irrational twists and turns, and many other aspects that can be known separately but are hard to understand holistically. The mechanistic approach can get stuck in “dynamic inertia.” That’s when an enterprise is in a state of constant activity, but going nowhere. Here’s what that looks like: the sales per share of the S&P 500 is still less than it was after the start of the recession in December 2007. That is, after years of advances in digital media and communications, the rise of the Internet and social media as essential marketing battlegrounds, and the emphasis on analytics and marketing automation, sales are down. We have more information about B2C consumers and B2B customers and prospects than ever. We see them when they're sleeping, and we know when they're awake, but we're selling them less than we did before. So, what's the Alternative to the Obsolete Funnel? “By introducing strategic planning and marketing strategy into the graphic communications service offering, firms are able to start upstream and engage with customers well in advance of the project inception. In fact, the graphic communications first that are involved in strategic planning and marketing strategy are usually involved in the definition of the program in a manner that will insure the plan is realistic and profitable. The second opportunity is for the graphic communications firm to practice what we’re encouraging you to preach: engage in lifecycle marketing yourselves. And there are at least three elements in lifecycle marketing that are typically missing from the conventional marketing v. selling model. The core responsibilities of marketing are brand building, attraction, and engagement with current and prospective customers. The core responsibilities of selling are creation, development, and retention of customer relationships. So the two overlap, and that’s often confusing. The confusion is used to justify and explain the chasm between marketing and selling, even when two separate departments don’t exist to battle with each other. And that’s our first example of an element of lifecycle marketing in B2B working much better. Lifecycle B2B marketing doesn’t view marketing and selling as separate, and doesn’t waste time trying to define an artificial dividing line between them. Instead, it bridges the gap between marketing and selling. That bridge typically includes several touches specific to the prospect timed just prior to first contact by a salesperson (either an inside or outside salesperson.) In essence, those contacts plow the road in front of direct selling effort by providing information that’s meaningful and relevant to that individual, and letting them know they will be contacted by a live salesperson within a specific window of time. When that bridge is built between marketing activity and selling activity, the likelihood increases substantially that selling activity will be effective. The contact from the salesperson isn’t unexpected. And the connection between the seller’s services and the potential customer’s circumstances and potential needs is starting to become clear. This improves substantially the likelihood that the first contact will be received positively. The bridge takes what are often separate marketing and selling processes, and connects them into a single, seamless business development process. And that’s a process focused on outcomes: the work of creating new customers and then keeping them. Lifecycle marketing doesn’t end with the first commitment on the part of the new customer. Far too often, we see a minimal handoff between the salesperson who created the new relationship and the CSR or other individual who is going to deliver service to that new customer. In many cases, the CSR doesn’t have access to the enabling agreement that defines the relationship, access to the history telling how the customer relationship was created, or even access to a recap of what the customer has been promised and told to expect. In contrast, lifecycle marketing takes the onboarding of a new customer seriously and builds an onboarding process to insure that it is done consistently, effectively, and quickly. When a well-designed onboarding process is built onto a strong business development process (the single process that includes marketing and selling), service delivery begins effectively. And since the highest risk event for most graphic communications companies is a first project for a brand new customer, this dodges most of the risk inherent in that first event. The renewal of a customer relationship often takes the form of a formal contract extension or an informal reaffirmation of the intent to continue the business relationship. Lifecycle marketing sees this as just as important as the creation of the new relationship. Graphic communications companies have long understood that the value of a customer relationship increases over time. Margins tend to improve as your understanding of the customer grows. Volume tends to increase as the customer trusts the company with more work and more important work. A renewal process that’s been intentionally designed and built into a lifecycle marketing process is very likely to deliver longer and healthier customer relationships. It’s also likely to reduce the risk of misunderstanding or a change in customer direction that goes unnoticed while everyone assumes everything is fine. Much of marketing at present is bound up in sponsorships, native advertising, and content marketing. Lifecycle B2B marketing can be built effectively around content marketing, but it requires content marketing done very, very well. In a recent study conduced by the CMO Council, only 15% of marketers ranked their content marketing efforts as “very effective” or “highly effective.” We think that self-evaluation is likely spot on. And very few graphic communications firms are practicing content marketing especially well. There is a powerful temptation to publish whatever it takes to get a prospect’s attention: press releases, vapid inspirational memes, kitten memes, epic fail videos, recipes, life hacks, or meaningless listicles. The objective is simply to trigger and then track any identifiable traffic. But even if the content is modestly relevant and appropriate, there’s a problem: Once a customer starts gathering information they leave a virtual trail – digital breadcrumbs that your competitors can follow in order to target those same people with offers based on their digital behavior. Your awareness trigger could be bread on the water for the benefit of your competitor, whether a direct competitor or competing media. And non-print / digital media providers are certainly smart enough to track interest in print media in order to offer and promote “better” alternatives. By the way, this is one of the unsung strengths of print marketing, particularly direct mail marketing: it leave no such digital breadcrumbs for competitors to follow and highjack. Content marketing done effectively requires strategic thinking that won’t be found in the funnel model even if big data and marketing automation are bolted onto it. Content marketing done well speaks in a meaningful way to prospective customers, and provides value in the form of actionable information. The acid test for good content marketing is: Is this useful for the recipient and sustainable for the marketer? The onus is on the content publisher to be engaging, not on the customer to engage. And far too many content marketers have that exactly backward, wanting to put the onus on the customer to engage and act. Their objective is the shortest possible path to a sales lead, no matter how cold, rather than engagement with a contact that may turn into a potential customer. The brilliance of lifecycle marketing that includes well-executed content marketing is that it puts and keeps its eye on the real prize: significant engagement with the customer throughout the lifecycle of that customer. And at the strategic level, that engagement can be measured and monetized, something that non-strategic marketing cannot successfully deliver no matter how big the data, how elegant the marketing automation, nor how steep and narrow the funnel. By the way, the roots of the idea first appeared in 1898 in Printer’s Ink magazine, the first national magazine focused on advertising and marketing in the US. "The mission of an advertisement is to sell goods. To do this, it must attract attention, of course; but attracting attention is only an auxiliary detail. The announcement should contain matter which will interest and convince after the attention has been attracted" (p. 50). The authors are the founding principals of UnSquaring the Wheel Corporation, an educational non-profit, and the authors of UnSquaring the Wheel: Comprehensive and Scalable Transformation, which was published in September 2015 and distributed by RIT Press. Chris Bondy is the Gannett Distinguished Professor in the School of Media Sciences at Rochester Institute of Technology. He also serves as Principal of Quest Consulting Solutions, LLC. Chris has over 30 years’ experience in printing and direct marketing leading operations and research and development. He is an industry consultant, trainer/speaker with expertise in workflow, strategy and technology. Wayne Peterson is the Principal of the Black Canyon Consulting Group Inc. Wayne’s 30-year career in Graphic Communications has included C-level assignments four times, and leadership roles in marketing and business development. He founded the Black Canyon Consulting Group in 2008, and he serves as a fractional executive for most of his clients. Wayne currently serves as EVP / COO for The Lane Press in Burlington Vermont. Dr. Joe Webb is one of the graphic arts industry's best-known consultants, forecasters, and commentators, and director of WhatTheyThink's Economics and Research Center. He is a 35+ year veteran of the graphic arts industries. He is also the co-author with Richard Romano of several books, including Renewing the Printing Industry, Disrupting the Future, Getting Business, and This Point Forward.